Clean water is essential to every habit on earth, making water quality management a key component of many environmental jobs. But careers in water quality are not just in high demand — they are also undergoing rapid changes. Climate change, population growth, and urbanization create new challenges that professionals must address to reduce negative impacts on water resources. What is the current status and future growth of Canada’s water quality workforce? ECO Canada conducted a recent study, titled Careers in Water Quality to find out. In 2013, Canada had an estimated 1.8 million workers who used environmental skills as part of their work activities. Over 27% of these workers (499,000 employees) apply water quality skills in their work, while roughly 83,500 professionals work in core water quality careers. The water quality job market is shifting to higher educational requirements. Nearly 75% of new job openings in water quality require a bachelor’s degree, but only 25% of the water quality professionals hold a bachelor’s degree. Developing or implementing environmental communications and awareness programs. Integrated water resources and watershed management. Protection of groundwater from contamination. Municipal water systems, including water treatment, water distribution, wastewater treatment, and wastewater collection. Water quality education, communication, policy and planning. 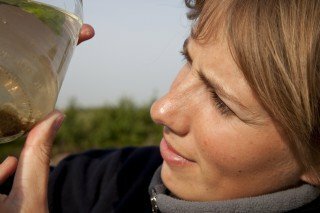 Water quality technicians, water resources engineers, water quality scientists, and professionals in water quality communications, education, policy and planning often begin with a bachelor’s degree or at least a three-year diploma for technicians. Typically, these professionals then make lateral career moves between different types of roles and employers, such as NGOs, governments, private industry, or consulting. Environmental engineers, engineers in water utilities, water systems operators, and green building professionals, follow more vertical career pathways. These workers progress from entry-level to senior level positions and through progressive management roles. Municipal water systems operators follow a more narrowly defined career path through four classes of certification. Based on their certification level and experience, these practitioners move up into system supervisor, operations manager, or facility manager positions. Earnings for water quality workers vary significantly, both for entry level positions and for workers with experience. These wage variations are linked to different types of employers and practice areas. Employers in mining, oil and gas, and environmental consulting offer the highest paying positions, while annual earnings are lower for workers employed by governments, conservation organizations, watershed management organizations and other NGOs. The average starting salary for water quality jobs is $55,284. The average salary for workers with at least 5 years of experience is $84,239. 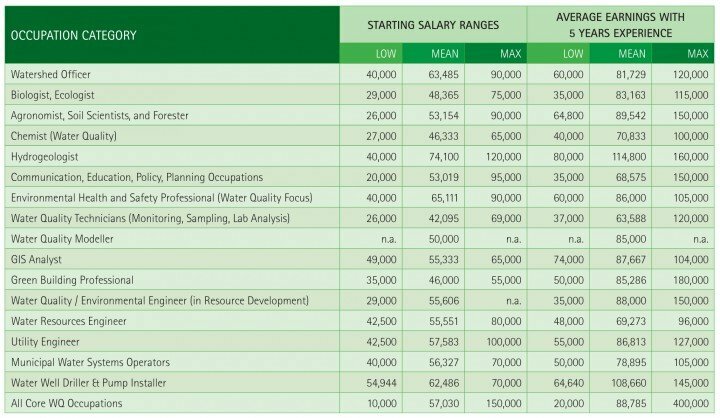 Hydrogeologists earn the highest starting salary at an average of $74,100. Mean Annual Base Salaries by Occupation, 2013: Starting Salaries and Top Salaries for Workers with 5 Years of Experience. The demand for water quality professionals is increasing. Employers of chemists, hydrogeologists, green building professionals, water utility engineers and environmental engineers are the most likely to expect their staffing levels to increase in the future. While there’s a higher concentration of workers near both of Canada’s coasts and in Alberta, there are different drivers of demand for water quality practitioners in each province. For example, Alberta’s oil and gas industry has driven high demand for water engineering occupations, water quality managers in natural resources, and water quality scientists and technicians. According to water quality professionals, climate change is the most commonly cited trend affecting the water quality job market and skills requirements. Changes in water quality standards including new regulations and technologies. Learn more about the status of Canada’s water quality workforce by downloading the Careers in Water Quality report.